It’s the second day of the RUNNR Expo! Head on now to RUNNR Bonifacio High Street in BGC, Taguig and avail of huge markdowns of up to 50% off from top running brands like Asics, Adidas, Newton, Brooks, Saucony, Skora OR enjoy slashed prices off your favorite tri and running apparel brands such as CW-X, TYR, CEP & Brooks. Dedicated walkers and runners invest a lot just to have the right pair of shoes. More than just picking out the best-looking pair, this means finding a pair that’s right for their feet, their running style, and what type of running they will be doing. More often than not, it is a trial and error process for the really passionate type of runners. According to Toby Claudio, president of Toby’s Sports and founder of the specialty store RUNNR, “These individuals put meticulous attention to how comfortable a pair fits and how much it enhances their performance. That’s why it will be a benefit to them to try out a pair first so they will experience if a shoe can actually turn them into a better runner. For someone in the athletic retail business, it certainly helps to carry a brand like Newton, the leading Natural Running footwear brand. Newton is committed to delivering superior performance and promoting optimal running form, and is now willing to back it up by offering a generous return/exchange policy that covers 60 days from purchase. Newton’s “60 Days of Better” is literally a trial run offered to those who purchase a pair at Toby’s Sports or RUNNR from September 15 to October 31, 2012. Customers can try on Newton 2011 and 2012 shoe models for 60 days, and if they are still unsatisfied, they can bring them back for an exchange. This offer shows Newton’s stand in meeting the needs of a demanding athletic clientele. The brand believes that runners must have a partnership with their shoes, which is rarely built in a day, and every step must be taken to make it last. Newton Running points out that unlike other running shoes in the market, all Newton pairs are built on a more level platform, mirroring the geometry of one’s foot. The brand also uses a patented Action/Reaction Technology™ that provides up to 60 percent more cushioning and 40 percent more energy return than leading brands. Simply put, it helps runners achieve a faster and more efficient midfoot/forefoot running form with less injury. Such product investments are meant only for those who put in just as much into the sport. 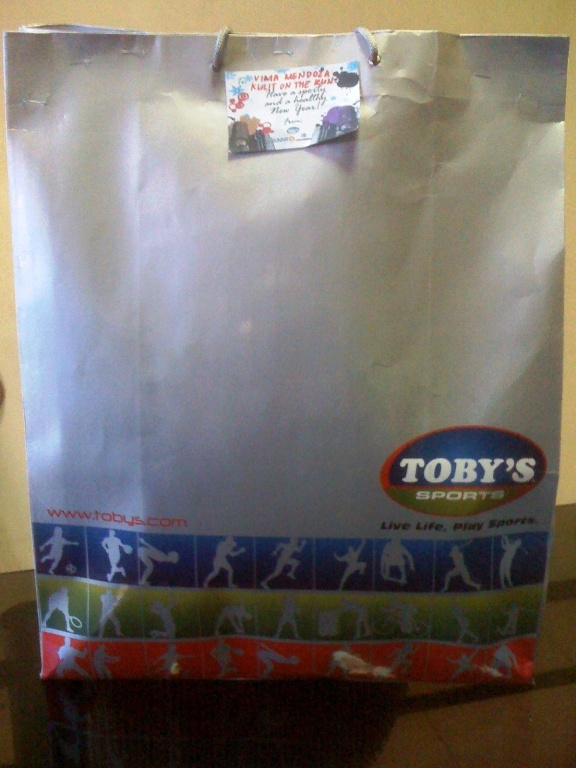 Newton Running shoes are available exclusively at selected Toby’s Sports and RUNNR outlets. For more information on Newton’s 60 Days of Better promo, connect with Newton Running Philippines on Facebook thru www.facebook.com/newtonrunningphils or inquire at 651-7777. Newton Running Philippines offers our customers a limited 60 day satisfaction guaranteed return policy. If you are not completely satisfied with your Newton shoes, simply drop by our stores within 60 days of purchase, and tell us why you would like to return your Newton Running shoes. The “60-DAYS-OF-BETTER EXCHANGE/RETURN” of Newton shoes is valid from September 15, 2012 to October 31, 2012, on purchases at RUNNR, and selected Toby’s Sports only. This policy is only valid on Newton 2011 & 2012 shoe models. Returned/exchanged shoe must be enclosed in the original shoe box, and must be presented along with the original receipt. The returned/exchanged pair of Newton Running Shoes must be in good condition and is subject to proper evaluation of the shoes. Reason for exchange/return due to aesthetic preferences shall not be honored as valid. In replacement to the returned/exchanged shoe, RUNNR/Toby’s Sports shall issue a return credit amounting to the same value of the shoe. No cash refunds. Returns/exchanges are subject to evaluation of Newton Philippines management. It will take 15 working days to process approval/disapproval of the requested return/exchange. Newton Running Philippines reserves the right to change this return/exchange policy without prior notice and to limit sales or returns in situations of overuse, misuse, abuse of this policy. When used as intended, Newton Running shoes have a life expectancy of 350-500 miles, or about three to six months. The Newton MV2 is a racing flat, and its life expectancy is 150-250 miles, or about three to six months. Returns and exchanges can only be completed in the country from which the product was purchased. Two Wednesdays ago, on March 23, I was invited to attend the launch of the RUNNR Academy. 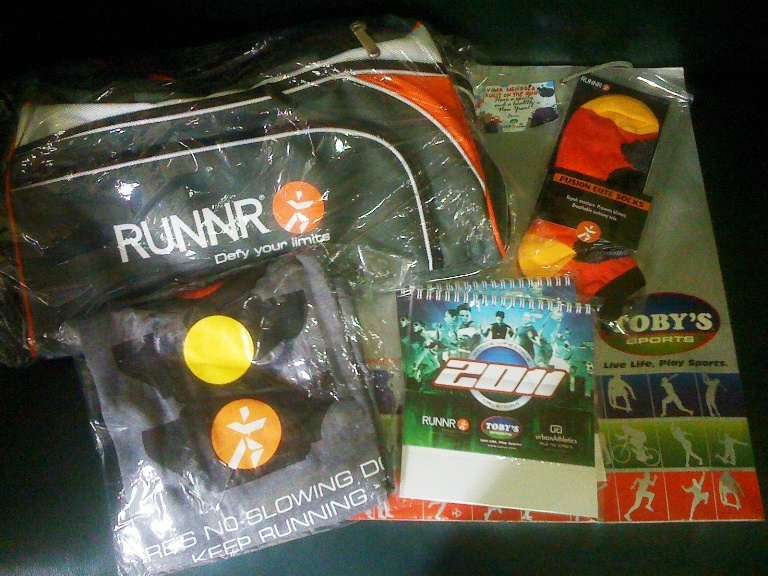 This, it seems, is RUNNR Store’s way of giving back to the running community as they were awarded “Store of the Year” at the 2010 Ayala Mall’s Merchants Awards event. The RUNNR Academy is an upcoming series of lectures in running for both beginner and advanced runners. The lectures will also be complemented by group runs wherein participants can learn to apply the things they learned from the lectures. During the launch, attendees got the privilege of hearing talks from The Bull Runner – Ms. Jaymie Pizarro and RUNNR owner and then Birthday Boy, Mr. Toby Claudio. An upcoming weekly series of lectures on running will fire up the interests of both beginners and advanced runners as they will get to know innovative health and training tips, strength and conditioning techniques, and other important strategies that will take them further into their sport. 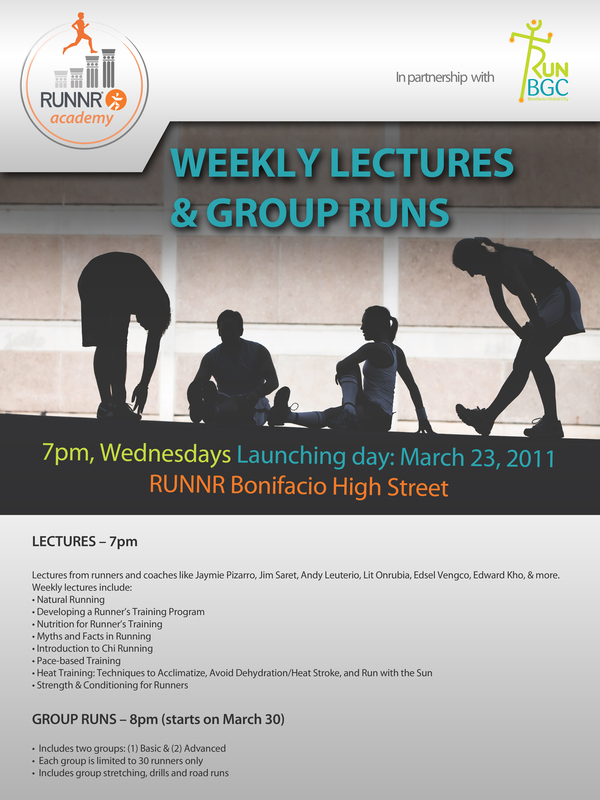 The RUNNR Academy, sponsored by the innovative and highly defined sports store RUNNR in partnership with Run BGC (Bonifacio Global City) and Newton Running, will be launched on March 23, 2011 at 7:00 pm. The evening lectures will be conducted by well-known runners and coaches like Jaymie Pizarro, Jim Saret, Andy Leuterio, Lit Ornubia, Edsel Vengco, Edward Kho, and others experts. Some of the topics they will be discussed include the application of the correct method of running; the importance of having a strong physical framework; techniques to acclimatize, avoid dehydration and run with the sun; determining the ideal weight, right nutrition, heart rate, and other health concerns. The lectures will be held subsequently every Wednesdays, 7:00 p.m. until May 25, 2011. Lecture is free for all. Lectures will be followed by Group Runs at 8:00 p.m. Lecture Participants will be divided into two groups of Basic and Advanced runners, each limited to 30 individuals and to be led by two couches along a predetermined route inside the Bonifacio Global City. Group stretching and other drills will ensure that the participants will get the most benefits out of each session. 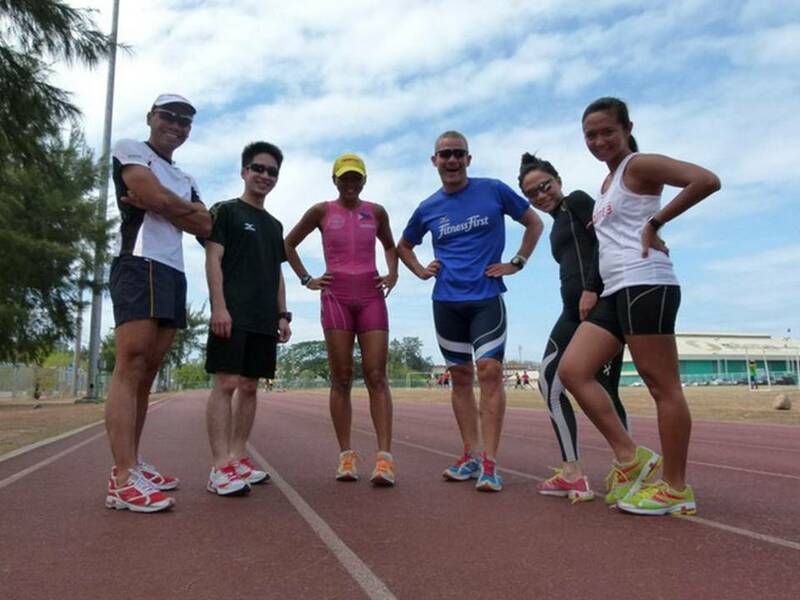 If a runner misses the group runs for 2 consecutive Wednesdays, his/her slot will be opened to new interested runners. RUNNR founder Toby P. Claudio explained that the RUNNR Academy intends to not just encourage interest in the sport but also share in-depth knowledge that can maximize one’s health and enjoyment. In the middle of January, I received a surprise New Year’s gift from the RUNNR/TOBY’s/URBAN ATHLETICS Family and I am so thankful for it. In fact, I am not just thankful, I am thrilled! Not mainly because of the content of the gift pack but more on the thought that all this time, they have always remembered to include me in their long list of friends! And it has always been that way. I occassionaly receive emails from them for the simple reason of keeping in touch. It touches me everytime. And for that I really, really would like to give my sincerest “THANK YOU!” to the RUNNR/TOBY’s/URBAN ATHLETICS Family especially to Nicole and Toby. This is made possible with RUNNR Store’s Asian Dream Race raffle promo, which starts tomorrow, May 14 and will last until the end of this month. The promo gives runners a chance to win 1 of 7 race entries to the Standard Chartered Kuala Lumpur Marathon which happens on June 27, 2010 at Malaysia. To join, all you have to do is purchase a pair of Newton running shoes and you automatically get a free entry to qualify for the raffle. Get a chance to win 1 of 7 race entries to the Standard Chartered Marathon on June 27, 2010 at Kuala Lumpur, Malaysia! 1. 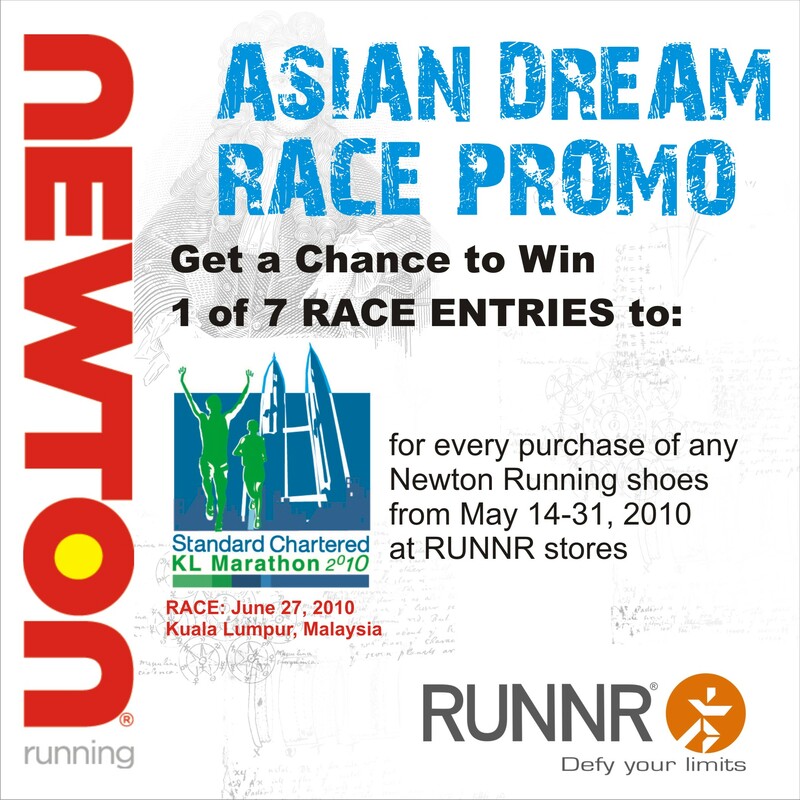 Get one raffle coupon for every purchase of any Newton Running shoes on May 14 to 31, 2010, in RUNNR stores. 2. Fill out the coupon with your complete name, address, birthday, telephone number, mobile number, model purchased, and affix your signature. 3. Drop filled-out raffle coupon at the designated drop box in RUNNR stores. 4. Deadline for submission of raffle coupons is on May 30, 2010. 7. Winners will be notified through registered mail and phone call. 9. Winners must bring two (2) valid forms of identification such as Driver’s license, SSS card, Passport, other government issued IDs, to claim the prize. Newton Running, the world’s top brand of running footwear, unveils the Asian Dream Race Promo! This special promo offers runners a chance to win 1 of 7 race entries to the Standard Chartered Kuala Lumpur Marathon on June 27, 2010 at Malaysia. The Standard Chartered Kuala Lumpur Marathon 2010 is one of the biggest running events in Southeast Asia that will bring many running enthusiasts from all over the world to the Malaysian capital. For every purchase of Newton Running in cash or through a Standard Chartered credit card, the buyer is entitled to one (1) raffle coupon that will qualify as one (1) entry. Customers should fill out the coupon and drop it in designated drop boxes in Runnr stores or in selected Toby’s Sports outlets. Deadline of submission of entries is on May 31, 2010. Winners will be drawn on June 3, 2010, and prizes can be claimed at the store where they bought their Newton Running shoes. Promo period is from May 14 to 31, 2010. More entries submitted will entitle the customer to more chances of winning. Participating Newton Running products are Gravity, Motion, Sir Isaac and Lady Isaac, and Motion All Weather. Visit RUNNR stores at Bldg. B3, Bonifacio High Street, and 2nd Level Ayala Center Cebu. It was a Friday (July 10) when I happily received an email from RUNNR’s Nicole Limon inviting me, together with a number of my fellow runner friends who blogs, to two “strictly by-invitation only” events which are both set to happen the following Friday, July 17. Two events in a day? Yep two! The first one, a Media Preview and Special Testing Day is scheduled on the morning from 8am to 11am and the second one, for the VIP Cocktails and formal ribbon-cutting ceremony befitting a grand launch for the RUNNR Store at 6:30 pm. As I was in sheer luck to have already scheduled a leave from the office on that day, I confirmed my attendance to both events. Fast forward to events day— I woke up at around six a.m. to the sound of heavy rains. My initial reaction was to reach for my cellphone and send messages to Marga, Jaymie, Jay and JunC to ask if they will be coming to the morning’s Runnr event. I even went as far as sending Air Urquiola, Runnr’s Business Unit Director, an SMS to confirm if the activity is pushing through. Air confirmed. Jaymie and Jay both said that they will just be attending the launch at 6:30 p.m., Marga wasn’t able to reply and JunC was the only one who told me that he and Mariel will be at Runnr by eight a.m. I was really unsure at that point if I will be going. First – because the weather is too good to sleep on and last and most importantly, I was hesitant to travel by commuting – what with the heavy rains and flooded streets that I might pass along the way. But then, I remember having given my word to Nicole when I replied to her email and confirmed my attendance. So off I went to Bonifacio High Street, mindless of the difficulty I had hailing a cab. I am attending the Runnr event regardless of the heavy rains or flooded streets because I know I am bound to have a good time in the company of runner-friends who like me have looked-forward to this day. Upon arrival at the RUNNR store, I was greeted by Marga who is having her breakfast, JunC and Mariel who are inside the store already, and Roe, Toby and a number of other RUNNR staff whom Marga and I already got to know since we first set foot into the store on “soft opening” day. After the initial greetings, introductions and pleasantries, Toby already encouraged me to either try the custom insole molding machine (Flashfit) or any of the CW-X apparels. At this point, Roe further explained that as a thank you gift, we are given a choice to avail of the customized insole or a CW-X apparel of our choice for free. As I wasn’t expecting any freebies of that sort, i told Toby and Roe that I prefer trying out the CW-X apparel. I also further explained that I already had the privilege of trying out the two technologies of the Footworx Fitting process namely the Footprint Scanning and Video Gait Analysis during Soft Opening day wherein results showed that I have a semi low-arch foot and a neutral/normal gait. As I am a runner with normal/neutral pronation its not that critical for me to try out the custom insole molding process anymore. Incidentally, Jaymie was able to share her experience of having her insole molded at RUNNR the night before the launch. Click here to read about it. With the choice already made, I was presented with different types of CW-X Performance Conditioning Wear. I paid particular attention to the tights as these are the ones I am really planning on buying in the near future. As explained by Julius, each Tights collection (or any of the other CW-X apparels for that matter) provides targeted support to specific muscles and/or joints in the body. A quick look at the chart made me decide on getting the Stabilyx which provides the greatest support among all the available types. I excitedly told Roe that the CW-X is just right in time for road-testing at the Run For Home race on Sunday. Watch out for my initial feedback on my use of the CW-X tights on a future post. I had my breakfast together with Marga and JunC who both have finished theirs but chose to sit with me at the table and Toby who is about to take his breakfast at the same time as I am. Over meals, we had an animated chat of sorts. Oh and by this time, Jay arrived out of our incessant prodding that he should and much to our delight. By the time we finished eating, Mark and Tiffin, Jinoe and Que and other runners who blog started to arrive. Having achieved a quorum of sorts, the formal welcome and presentation already started with siblings Liz and Toby Claudio taking on the floor. As explained to us, the Runnr Store concept was borne out of Toby’s Sports founders, Bobby, Jojo and Toby Claudio’s realization that running is not just a trend but a new way of living. They have thought of opening a running specialty store with all manner of runners in mind. A store that brings together a number of great running gear brands, customized footwear and also reliable running-related advice. There are a lot of things that RUNNR has in-store for us runners. To know more about these, click here to download the Announcement Release and here for the Feature Release. The morning ended with several photo-ops and lively chit-chats from those present. Each one going home with their mind and heart full of knowledge about what great things are at hand for runners at the RUNNR store, a tummy full of a hearty Pancake House breakfast and hands full of either a CW-X apparel or a Customized Insole, a coupon bearing a special 50% discount for a possible Newton running shoe purchase or a 30% discount on any other brands to be purchased within the store and a Runnr loot bag with lots of goodies inside. Oh and of course, the reminder not to forget to attend the launch at 6:30 p.m. If the morning’s activity is to serve as a preview/prelude of things to happen at launch night, we are to face one great party. One that will be worth siblings Toby and Liz’s and their staff’s sleepless nights. inside the jampacked tent! oh, what a launch it is! We were correct. Upon arrival and entry to the party tent set-up just in front of the store, we were given a baller band to serve as our entry badge to the event and race bibs, with our name and a number to serve as our raffle number. We were also made to pose for a picture with a Runnr tarp as our backdrop. Cool! It’s just like what happens when you attend a movie premier or an award’s night ceremony. Of course, I gave the sweetest smile I could sheepishly muster. 😉 The kulit in me felt shy at that moment, realizing the number of VIPs I am slowly recognizing to be inside the tent. The event was filled with VIPs and celebrities from almost all industries – business, sports, media and show business. There were celebrity runners, triathletes and coaches, sports doctors and what have yous. And of course, there were my runner-blogger friends, each a celebrity in their own right – Jaymie of the The Bullrunner fame, Jay who is soon to be a Running-DJ, Ben, our Photog-on-the-Run, Bards and Dindo who are marathoners, Dingdong, our very own running doctor, Tin, who looks great in her phueys, JunC and Mariel of the Solemates, Jinoe and Que of the takbo.ph community and of course, Marga our dear friend and RunRadio executive producer. It was a party alright, what with cocktails that include delicious and healthy canapés and drinks – uh-oh, there were no liquors though. Drinks are everyone’s favorite Gatorade, bottles and bottles of it! The program, as hosted by pretty Reema Chanco was started with a video-presentation about Runnr, a speech from owner Toby Claudio himself, a ribbon-cutting ceremony led by Fernando Zobel de Ayala together with celebrities Tweety de Leon and Karylle and a raffle which includes running gears, running shoes of various brands and Polar watches and heart rate monitors as prizes to name a few. The raffle happened while the VIPs were taken inside the store for an exclusive tour. After the exclusive cocktails, the party was opened to the public wherein the first one hundred registrants were able to pick a prize consisting of various running-related items. There were also a raffle and games and the announcement of the five lucky winners of the running shoes as a result of the contest published on Runnr’s facebook account. It was clearly one launch that everyone will never forget. Us most of all who not only got overwhelmed with our freebies and two loot bags (yep! we received two – one from the morning’s event and the other one after the launch!) but also from the warm reception and treatment that we received from the Runnr staff and Toby Claudio himself. Congratulations, thank you and best wishes to RUNNR. Here’s looking forward to sharing great running experiences with you. 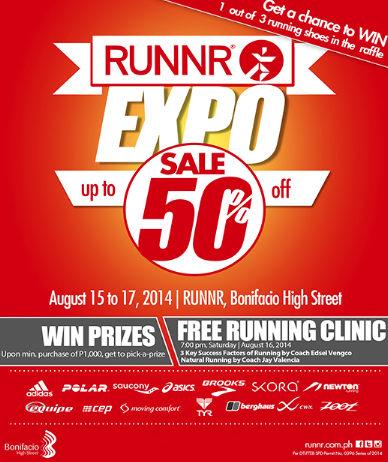 For more information, you may visit the RUNNR at building B3 of Bonifacio High Street or log on to http://www.runnr.com.ph. RUNNR can also be found on Facebook and Twitter.